Before you start, you need to know three things about the unit: the frontage, the number of ranks, and the size base they are on. From this you can figure out how wide and deep the unit is so the movement tray is the right size. 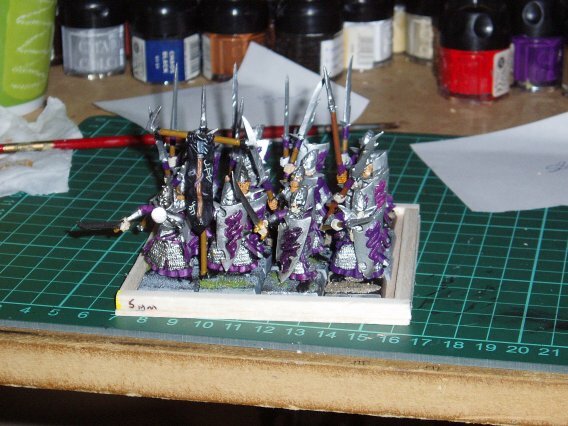 For this unit, some Dark Elf Spearmen, the unit is 4 * 4 (easy), and on 20mm bases. It’s best to keep the measurements in mm as when you start working with half centimetres, you sometimes get the urge to compromise your measurements. From those figures, I can figure out that the unit is 80mm * 80mm. It’s nice square unit. Don’t start cutting wood just yet though, as there are a few things to do first. The 80mm square area will hold the unit tightly, but it may be too tight. To fix this, add 5mm to the front and one side (ie. the depth and width will increase by 5mm each, so 80 X 80 becomes 85 X 85), giving a bit of clearance. This allows the models to fit nicely in the tray, while still having enough room to move in and out without the use of tools to prise them out. Now you have that measurement, you have the area your unit takes up. The next step is to figure out how wide the base will be so a lip can be included, just to make it look nice. I make the lip of the base out of 5mm square balsa rods, although I’m sure there is a similar product in plasticard stock that can be used. Because one of the rods goes on each side of the unit, you get an extra 10mm added to both the width and depth of the unit. That means you have to add 10mm to the width and depth of the area that was figured out in the last step (the one where the unit has room to move). That’s going to give you a result of 95 * 95mm. 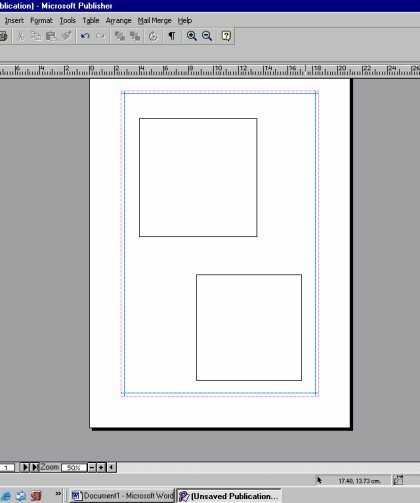 A word of warning is to make sure that the print setup is set to A4 paper, or whichever size paper you use BEFORE you start drawing. This way you can plan for the borders etc on the page. Also make sure the measurements are in mm, or at worst, cm. The top one is the 95mm squared base, and the bottom one is the 85mm base. I’m going to take these, cut them out, and glue them to a piece of 16mm thick balsa wood. You can see here that I have glued them to a piece of wood. I would suggest several things here. 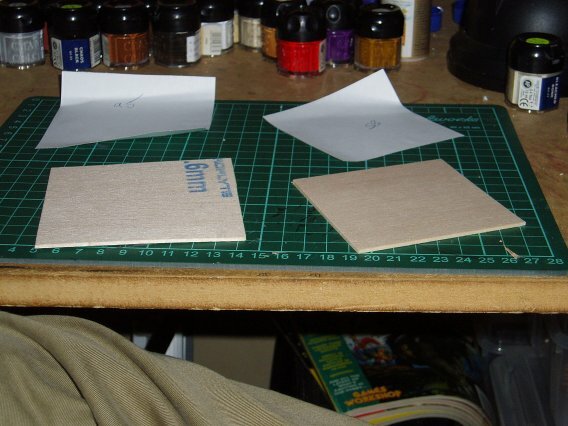 First, try and line them up so corners are on corners of the wood, or edges are on edges. Also try and get several pieces to touch each other, as it will make it quicker to cut out. I’ve glued them down with a glue stick that should be available anywhere. The brand shown is UHU (I think), and judging by the amount of different languages on it, it is available anywhere human life exists. A suggestion here that will save you money is to by the cheapest, nastiest, rip-off version of this that you can find. Anyone that did kindergarten in Australia will tell you these glue sticks can only just stick paper to paper, and only if left for about an hour to dry. The rip-off versions are even slower. Not much will stick to balsa wood due to the smooth finish and powdery texture of it unless you really want it to. While this brand will stick the paper to the wood, we want it to come off later. I cut the pieces out before it had a chance to dry, but a cheap version should give you some time up your sleeve. You can also see in this photo I’ve cut the lip pieces out from the balsa pole. There are two 95 mm long pieces, and 2 85mm long pieces. This is so that the 95 mm pieces can go on the front, and the two shorter pieces can go on the side and fit between them. These are the pieces cut out, with the paper removed. It should easily peel off if you work quickly. Now you are ready to put it all together. Here is the 95mm square piece with the two 95 mm lip pieces glued onto the front and back of it. I just used PVA glue to glue it down. When you are letting it set, first make sure that the edges are all lined up well. If there is over hang on the corners where the lip sticks out too far (it might have been measured as 97mm for example), don’t panic. It can be trimmed back when the base is dry. Just make sure the long edges are flush, and then flip the base over so it is sitting on the lip. Place something like a thick book over the top to keep everything pressed down. 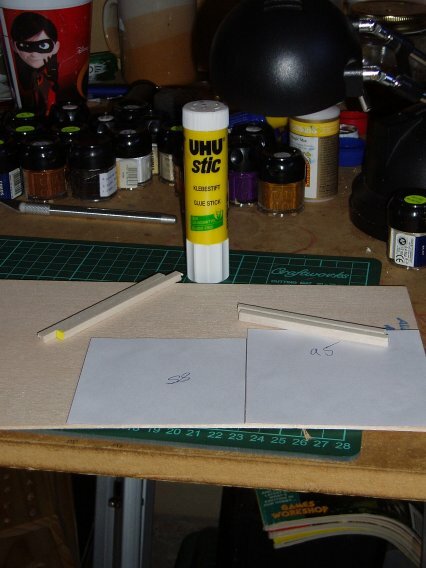 That should keep everything in place until the glue is set, and helps to prevent the wood from warping up when drying. Here it is again, with all the lip pieces in place. You may have to trim the shorter pieces down before you put them in. Just make sure everything is flush. If there is a gap between two lip pieces because a shorter one is too short or hasn’t been cut square, then flocking will usually cover up that slight error. I would also advise sliding the smaller square of wood in between the lip sections at this time to help keep them square. Once again, let them set for a few minutes. After that is done, glue the smaller square into the middle of the base, and it will raise the area the troops stand on. This will mean the tops of their bases will be roughly level with the top of the tray. 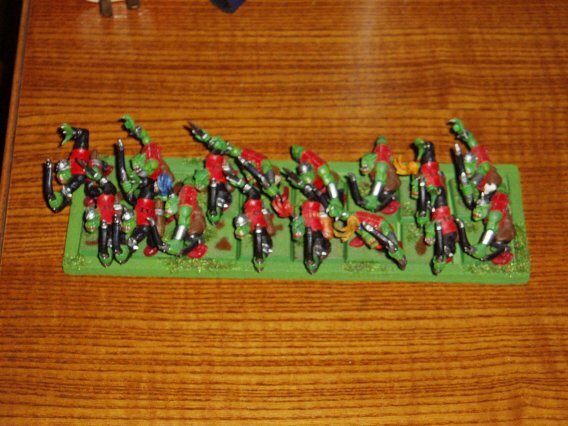 After that is set, you can put your troops in, ready for basing the tray, and possibly some of the troops. Just try and glue the smaller piece in so that the grain of the wood goes in opposite directions, as the wood shouldn’t warp as easily this way. However, the weight of the models usually fixes that. This may mean planning how you glue the pieces to the wood at the beginning if it is not a square unit. I don’t have any pictures of this base completed yet, but I do have a few of other bases I have completed. 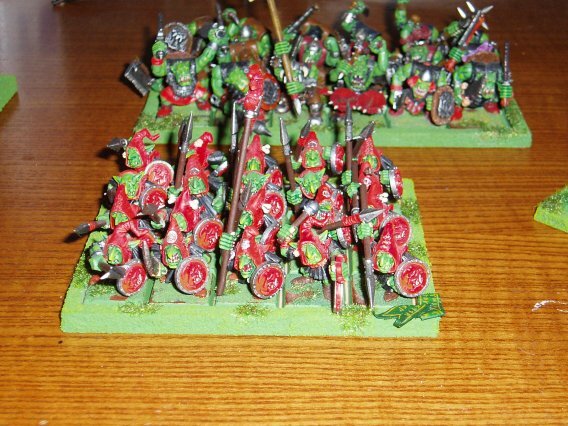 These are bases I have done using a similar method. The difference was that the lips were made of two pieces of 16mm thick balsa wood glued to the top of the tray, rather than a 5mm pole with the raised area in the middle. This meant that the lips were often a bit wonky, which is why I changed to the solid pole. 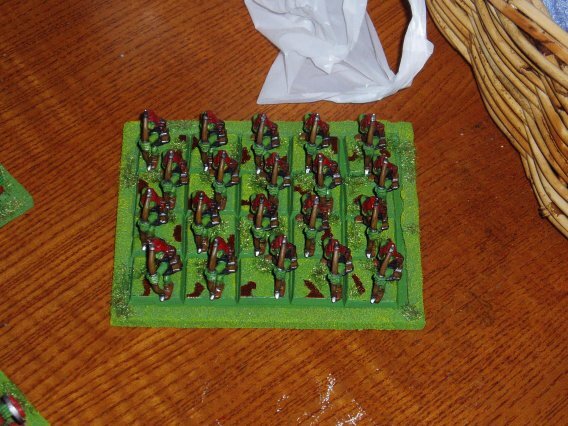 I didn’t raise the troops ground area in the tray, as the bases were already level with the top of the lip without it. As you can see, the tray can be flocked and decorated just as well as any base can. My Night Goblin’s base. This was the first, and only other tray, I have done with the 5mm lip. I can tell you it is more solid, easier, and quicker to do than the other ones. 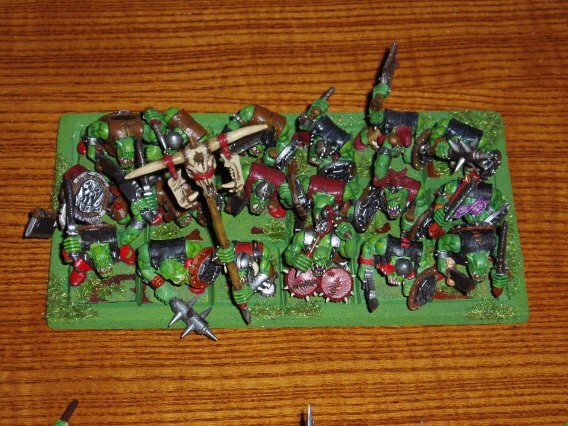 This also shows that the tray can support small decorations being added to it, like the dwarf banner made from milliput in the front left hand (model’s view) corner. This base hasn’t had the raised area in the middle painted. I would suggest painting it on trays, as the colour will show through between the bases. The best colour seems to be the colour you paint the edge of the bases themselves, as it blends into the other bases and works nicely. Another one of the old bases, but this time it is for my chariot. With a little patience, you can create a few special effects and scenic displays using this method. 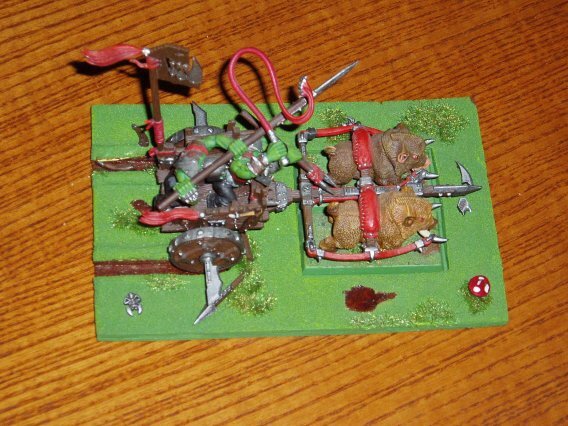 For instance, this chariot had the bases attached to the boars before I made the base. I didn’t want their bases sitting on top of the tray, so I had to sink them in. However, that meant sinking the chariot wheels in as well. To make a good effect, I cut away the area under the wheels, and also behind them. I then built blu-tack up around the holes (because milliput wouldn’t stick), and covered it in superglue to harden it. When I painted it up, it looked like the ground had been ripped up by the chariot. ·	Measure twice, cut once. The computer side takes a lot of the effort out of this, but always make sure your calculations are correct, and that they print out at the right size. ·	When cutting across the grain of balsa wood, several light strokes with the knife are better than a deep, hard cut. It means the balsa wood won’t splinter so easily. ·	When cutting out square objects, even to a plan that is drawn or marked on wood, ALWAYS use a straight metal edge to guide the knife. It will make your life a lot easier, and possible save your fingers to. ·	Be careful with knives. They are sharp, and won’t distinguish between your finger and the wood. ·	Go slowly, and you are less likely to mess things up. Patience always pays off. 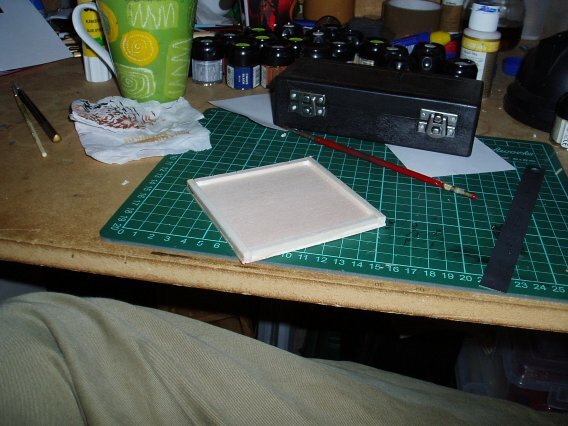 ·	Spend as much attention to the tray as you would to a base that has that much area, and paint it in the same way. The only difference between the way I do my bases and the way I do my tray is that tray edges are flocked, but base edges are left smooth. If you pay attention to the tray, it helps improve the overall look of the unit as a whole. Finally, just a note on the time taken. I didn’t time myself, but from what I can figure, if you go from one step to the next, and only stop to let the glue dry enough, you should be able to get the tray finished in half an hour before you paint it. You can probably speed up the process and do several at once, but half an hour seems fine to me. Also, a final note on costs. The long balsa sheet cost about $5 Australian if I remember right, and the pole cost about $4. 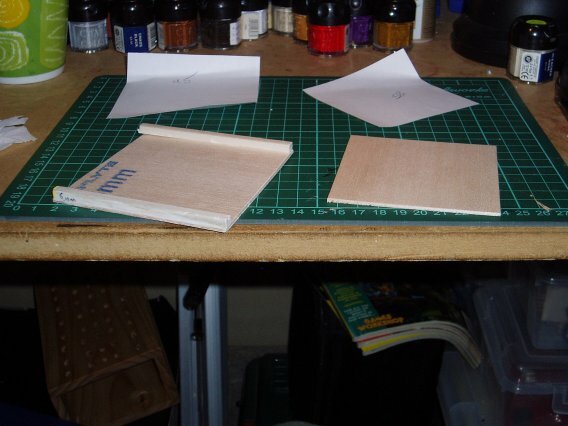 You will get about 4~5 bases from a sheet of wood if you use it right, maybe even more. You will get the lips for about 3~4 bases from one pole. I’d say that, percentage wise, and including cost for glue etc., a tray should cost around $5 to make. Its pretty sturdy with the second layer of wood in there, so it should last a fairly long time as well.